Active -> Responsibel for creating the state and translation tables, transferring the data packets and monitoring the other units. The active and standby units are connected through a dedicated network link and send failover-related messages to each other. This connection, known as theFAILOVER CONTROL LINK is established over a dedicated failover LAN interface. The ASA sends additional testing packets to the remaining interfaces to determine where the peer’s control interface is also down. If the peer’s control interface is also down, then failover does not occure and the failed interface is marked as “Failed”. However, if the peer’s control interface is not down, then failover occurs because the standby unit is deemed healthier than the current active. Broadcast Ping Test -> Sends a broadcast ping request and then counts all received packets for up to 5 seconds. If any packets are received, the interface is operational. 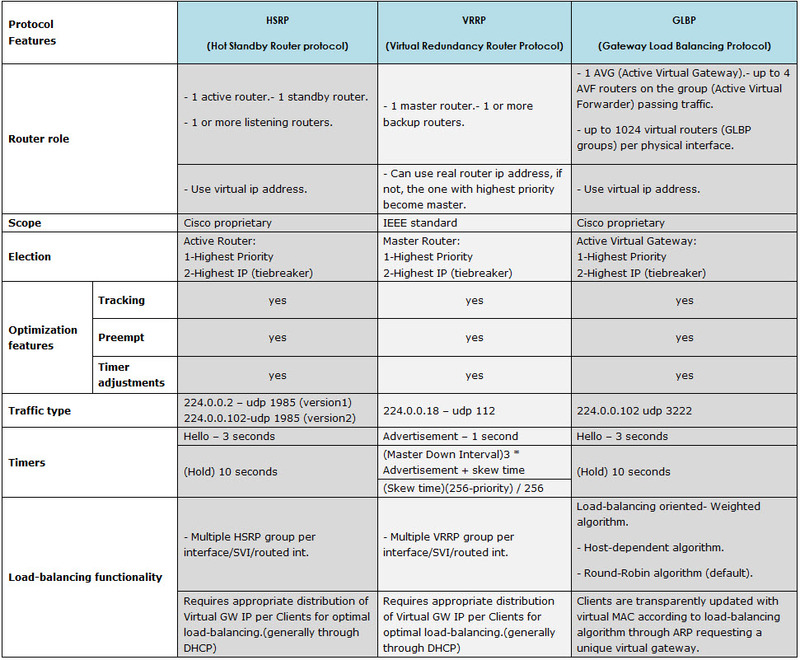 CONNECTION TABLE: Connection entries include the source and destination IP address, protocol used, current state of the connection, the interface to which it is tied and the number of bytes transferred. In stateful failover, the active unit sends updates to the standby unit whenever these is a change in the state table. In this mode, the active unit sends stateful updates over a dedicated link to the the standby unit. When the standby unit becomes active, it does not need to build any connection entries because all the entries already exist in its database. In active/active failover, it is possible that packets can leave one active unit and can return to the other active unit. The ASA implements a feature known as “asymmetric routing” to guide packets back to the context from which they originated. If the asymmetric routing feature is enabled, the units restore asymmetric routed packets to the correct interface. The unit that sent the original SYN packet will replicate the connection table entry for the SYN packet to the standby unit over the stateful failover link. When the standby unit receives a packet but does not have an active connection, it checks other interfaces that are in the same asymmetric routing group for the corresponding connection. The Layer 2 information is written and forwarded to the original unit. During traditional device-level failover, traffic gets disrupted even when stateful failover is enabled. Redundant interfaces are only supported in version 8.0 and higher. *** There can’t be a “nameif” command on an interface when configuring failover on it. Also “managment-only” needs to be removed. You can use the “failover exec” command to send commands to the correct unit. *** If a failover key is not used, the active appliance sends all information in clear text, including the TCP/UDP states, the user credentials and VPN-related information. *** The Admin context is always a part of failover group 1. If you don’t explicitly map a context to a failover group, then it is automatically assigned to group 1. Specify failover MAC address – in Active/Active failover, during failover, the IP addresses ad MAC addresses are swapped between units. The new active unit sends out a gratuitous ARP on the network. Using gratuitious ARP, the Layer 2 devices including bridges and switches, also update the CAM tables with the MAC address and the updated switch port information. The use of virtual MAC addresses is useful to avoid disruptions. With the virtual MAC address, the appliances do not need to swap the MAC address. By default, ASA sends periodic keepalives (hello) packets to check the status of the peer failover unit. If the standby unit does not receive acknowledgement packets for the keepalives sent out, it initiates a failover only if it deems itself healthier than the current unit. In active/active failover, unit failover timers are changed in the System Execution Space. The interface failover timers are changed in the failover group policy. *** When an ASA is configured for failover, whether active/standby or active/active, it monitors the status of all the main physical interfaces that have a “nameif” and an IP address configured. *** Interface monitoring is disabled by default on all subinterfaces until you explicitly enable it. *** Stateful failover is mandatory for a zero-downtime software upgrade.